This is the pile of notes that have accumulated on my bedside table since I've been back from my research trip. Can you tell I'm having a hard time sleeping lately? I feel like a mad scientist, jotting down random snippets of prose or plot ideas. I swear the rest of my life is crazy organized--and even my research notes and hard copy edits--but this particular pile is, well... not. 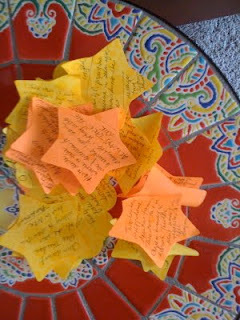 I am now off to weed out the junk and put the decent sticky-notes to good use in birthing some sort of star. Hopefully not a supernova. And by the way, hello again!